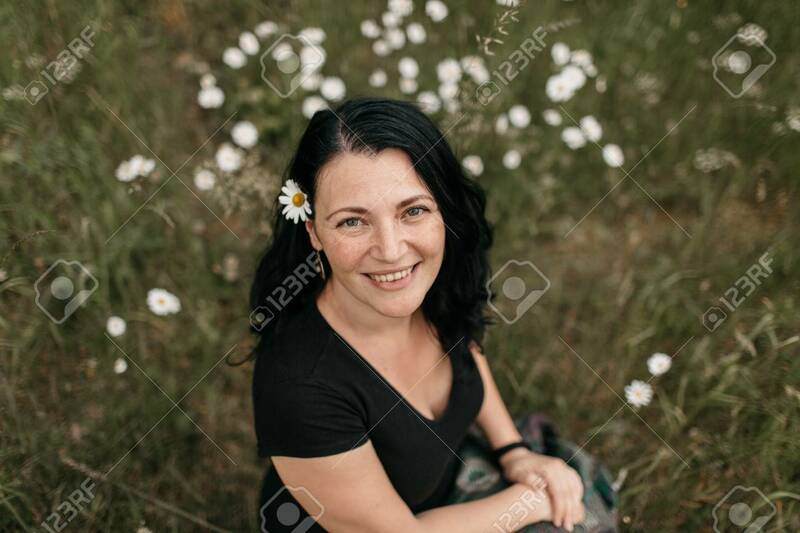 A High Angle View Of A Young Smiling Woman Sitting In Grass Wearing A Daisy Flower Behind Ear. A Close Up Of A Cheerful Woman Relaxing In The Nature. Фотография, картинки, изображения и сток-фотография без роялти. Image 103306426. Фото со стока - A high angle view of a young smiling woman sitting in grass wearing a daisy flower behind ear. A close up of a cheerful woman relaxing in the nature. A high angle view of a young smiling woman sitting in grass wearing a daisy flower behind ear. A close up of a cheerful woman relaxing in the nature.